James Siddons was active in early electronic music (1970 and earlier), composing a number of works of tape music using Moog and other analog synthesizers. Following the example of Merrill Ellis, founder of the electronic music program at the University of North Texas, these works are multimedia in content, and combine tape music from the electronic music laboratory with live performance. Several of these works are theatrical "happenings"; one was produced and videotaped at a television studio in 1969. Upon hearing a performance of Merrill Ellis' Kaleidoscope for soprano, live electronic performance (on a Moog II) and orchestra in Dallas (April 1967) Siddons resolved to study and compose in the electronic music studio at the University of North Texas, which he did from 1967 to 1970. Some of the works created in this period are listed below. 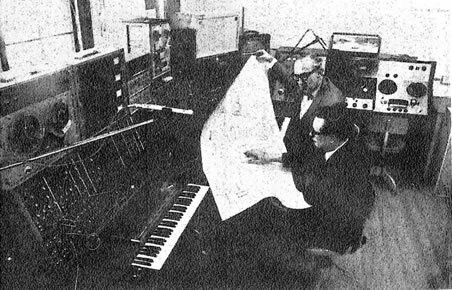 Merrill Ellis (upper) in the Electronic Music Composition Laboratory of the University of North Texas in 1968. The Moog synthesizer is in the lower left, above the keyboard. 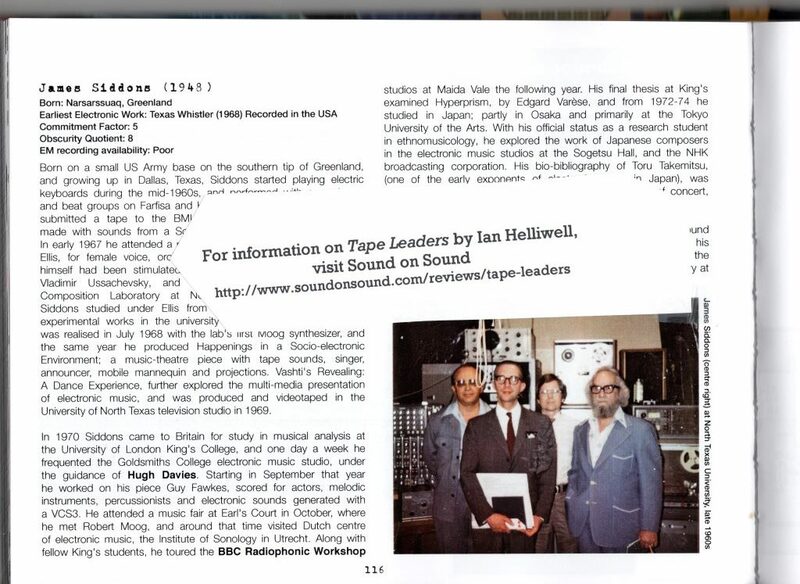 For publisher's information on the Ian Helliwell book Tape Leaders, click here. For author's information, click here. The works below were all composed by James Siddons between 1966 and 1970, and are considered to be examples of early electronic music because 1) they all involve music captured on magnetic tape, 2) they all are centered on musique concrète and/or analog sounds created through voltage-controlled sound generators, and 3) they used Moog and (in London) VCS3 (by EMS, London) synthesizers. These works range from audio-only tape pieces to multi-media theatrical works in the nature of "musical happenings." Untitled tape piece (¼-inch magnetic tape, two-channels) of sounds from a Solovox electric keyboard and modified 1903 Pease piano. Unsuccessful submission to the BMI Student Composers Competition. "Texas Whistler." Tape piece; duration: 2 minutes. The tape recording is lost, but the graphic score (11x17 inches, 8 pages, using a template design by "L. Sille" [Ellis spelled in reverse]) survives, as well as a score for the percussive rhythms (achieved by rapping fingers on a microphone screen) used in the musique concrète content of this work. The title refers to a small, rocket-like type of fireworks. 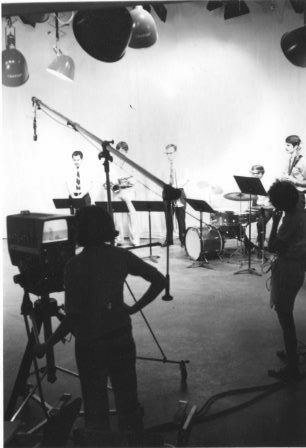 Realized at the University of North Texas elecronic music studio in the summer of 1968 as part of a summer workshop for composers from throughout the region. Happenings in a Socio-electronic Environment. A musical happening that experimented with the removal of time as an organizer of society. As a tape of electronic sounds made using a Moog synthesizer played, a singer, an announcer, a mobile mannequin, and other rehearsed participants were seen and heard throughout the performance space; visual effects using lighting and overhead projectors were used; a mock newspaper, the Oscillator, reporting events in the happening in the past tense, was handed out to the audience during the happening; spontaneous audience participation was encouraged. 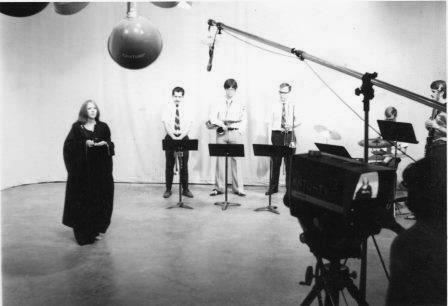 Merrill Ellis assisted with the planning and production of this happening, which took place as the concluding item in a recital of works created in a summer workshop at the Electronic Music Composition Laboratory of the University of North Texas, on July 31, 1968. Due to the spontaneous nature of this happening, only a few planning memos remain. Vashti's Revealing. An experimental multi-media theater piece, loosely based the Biblical story of Vashti (Esther 1:5-12), deposed queen of Xerxes I of Persia, that imagines that Vashti later went to the royal banquet in a ritual procession, with a choir of priestesses, to perform a dance. 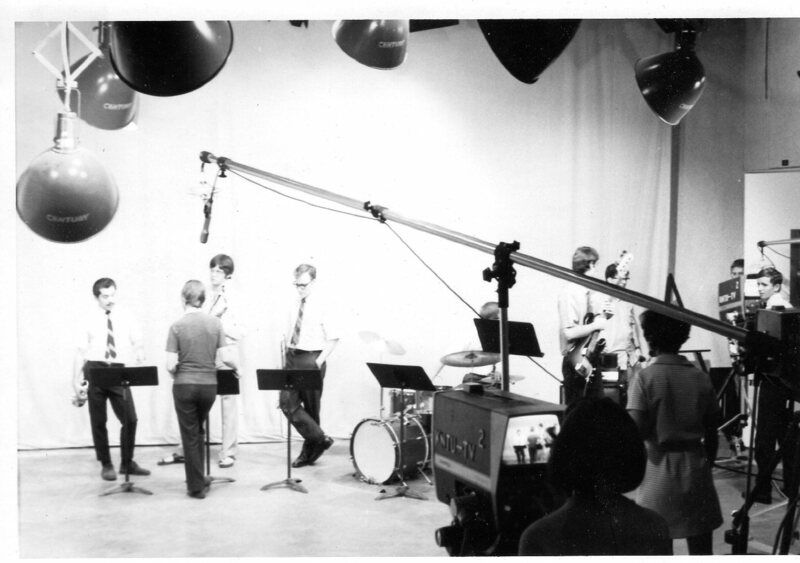 Produced and videotaped in the studio of the University of North Texas television station, KNTU, in July-August 1969. The videotape, made on a U-matic recorder, was played in a School of Music recital in October 1969 by positioning a television (monitor) in the front center of the recital hall stage. The tape was retained by the television studio, and later lost. In addition to a tape of electronic music realized in the University's electronic music studio on a Moog synthesizer, this work calls for projection onto the studio walls of graphic designs, a tape recorder operator to play the tape music on cue, and a cast and musicians as follows: Vashti (dancer, female), a man in the audience/living statue (actor, male), flute soloist, small jazz ensemble (improvising from an indeterminant score), and a vocal ensemble (six women). 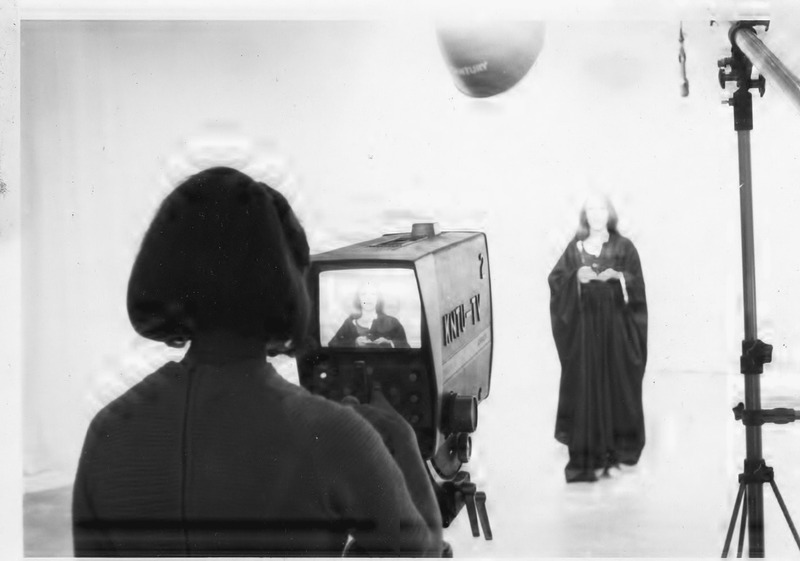 Scenes from the production of Vashti's Revealing at KNTU, 1969. In the upper photo, James Siddons (back to camera) is talking with three of the jazz musicians. In the lower photo, the character "Vashti" is facing the camera. The next two photographs were taken during the performance and videotaping. 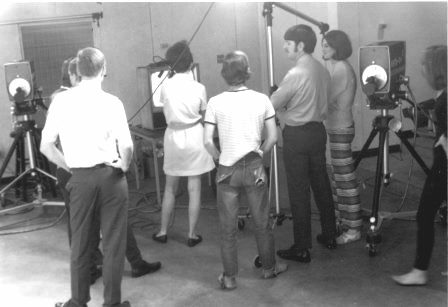 In the final photograph (below), some of the performers and production staff are viewing the U-matic videotape on a television monitor. parts; six tones only in the written parts: D, E, F, G, A, B; played by six male instrumentalists. D; has F# key signature. elaborate costuming and props than Scenes 1 and 2.
distant views; frequent double exposures. Chant instead of speech: words and music combined. The chant is the music of first part of the dance music, a ritual procession. Chant is sung from memory by six singers (priestesses). There are only six tones: eb, gb, ab, bb, db, c. The second part of the dance music, for a solo dancer portraying Vashti, is a tape of electronic music. Electronic music: tape music; slow, soft; always the same electronic sounds. Set: faint lighting, six burning candles. Cameras: shots often overlaid, slow fades, some out-of-focus. A House for All Men. A portrayal of the cruelty suffered by African-Americans in the American South during the days of segregation. The original form of this work consisted of thirty-three Kodak slides to be shown in synchronization with a tape recording of music and sound lasting 4 minutes and 56 seconds. The images in the slides include some photographs and a title card by James Siddons, and a number of photographs taken in the late 1930s by agents of the Farm Security Administration (these photographs are now part of the FSA/OWI Collection in the Library of Congress). The music consists of theme music composed by, and performed on piano by, James Siddons, a song in the style of a Southern work song (words and music by James Siddons), electronic music composed by James Siddons and realized on a voltage-control analog synthesizer built by Robert Moog in the late 1960s, a snare-drum roll, and a Bible reading (Micah 2:1a, 2). In this form, A House for All Men was shown to three small audiences in 1970. In 2016, a video was created using the slides and tape recording, which had lain in storage for 46 years. The images and audio recording were edited as necessary by James Siddons. Although this work is inspired by the Civil Rights Movement of the 1960s, it remains relevant today. Note: some of the images depict violence. To see the video A House for All Men, click here. To see and download the musical score for the theme music and folk song, click here. Guy Fawkes. A Musical Theater Work for Male Actor, Female Actor, Electronic Music Tape Recording, Percussionists, and Melodic Instrumentalists. The composer’s attention was drawn to the historical Guy Fawkes when he heard a child with a stuffed effigy say “A penny for the Guy?” near Russell Square, London, in November 1970. That inspiration led to the scenario of an imaginary dialogue between a fictional 17th-century London Herald and the Spirit of Guy Fawkes (the female actor) about the meaning of the famous bomb plot. A tape recording of electronic music, realized at the Goldsmiths’ studio using a VCS3 synthesizer by EMS (London), is heard throughout the performance. Duration: 5 mins. The score, tape recording, audio control diagrams for the synthesizer in the Goldsmiths’ studio, and musical parts are extant. An important development extending from his research in, and composing of, electronic music was Siddons’s M.Mus. thesis at the University of London, an analysis of Varèse’s Hyperprism (1923), which Siddons studied, along with Varèse’s other works of the 1920s, as precursors of the Poème électronique (1958), and electronic music generally. Varèse’s interest in the structural design of crystals as a basis for tonal organization led Siddons to look for ways of describing electronic music, often amorphous and without measured time, in precise terms, or in precise graph notation. Another effort at this was his analysis of one of Stockhausen’s Klavierstücke I—IV (1954) for his portfolio of analyses for the M.Mus. degree. Taking a cue from Stockhausen’s statement, “Different shapes from the same light,” Siddons identified distinct groups of three pitches that could each be represented by triangles of varying colors of ink. A study in 1978 of Varèse’s Density 21.5 also revealed triangular and other shapes reminiscent of crystals that could be represented in graphic designs and notation (published in Perspectives of New Music, 1984: click here to read or download). Copyright 2001-2016 James Siddons. All rights reserved.